Dogs that are highly active will drive you crazy if they don't get enough exercise. Biking with your dog is a great way to burn off that energy and keep you both sane. You could teach your dog to ride your bike but the pedals and seat might need some modification. 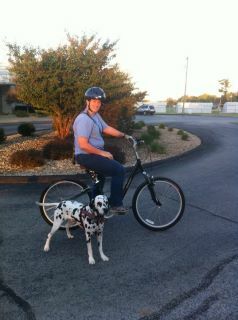 The way I recommend biking with your pooch is to use an attachment to the bike that will leash the dog safely. General consensus among enthusiasts rate the Walky Dog as the best http://www.thedogoutdoors.com/. The equipment attaches just under the seat on the frame of the bike. The dog wears a harness hooked to a leash that runs through to a spring loaded bar. It absorbs the shock if your dog pulls and your hands stay on the handle bars where they belong. There is some training you should do before you jump on the bike and ride off into the sunset. The Walky Dog webpage (http://www.thedogoutdoors.com/) has videos demonstrating the use of the equipment. I recommend acclimating the dog to the bike by walking the bike with the dog attached and get them used to how it feels to have the bike turn away from them and into them. If the dog is fearful you may need to have a friend hold the dog and let them get used to just walking beside the bike without being attached. Begin slowly and ride at a pace your dog can handle. Don't go out the first ride and expect to pedal 10 miles. Get your dog into shape by gradually building the mileage. Watch for sensitive pads on your dogs feet. Remember that they are running "barefoot" and need to get used to running on pavement. Around Springfield you can bike on any of the greenways trails. My favorites are Seqiouta, Nathaniel Greene, and Wilson's Creek. Have fun exercising your dog while not wearing yourself out!